We have been counted amongst the most trusted names in this business, involved in providing supreme quality range of Gerbera Plants. 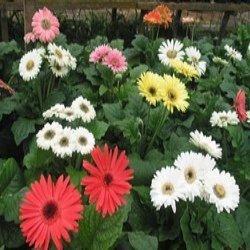 These Gerbera Plants are cultivated under pure and hygienic conditions by using supreme grade fertilizers. Our product is available in market at most reasonable rate. Easy to grow Phalaenopsis our amazing range of Urban Orchids are perfectly happy indoors, a bright dining or living room table or even your cabin in the office is ideal for this beauty. With some of the longest lasting blooms, they come in colours ranging from White to Pink to Orange. With every passing bloom, the flowers grow larger and even give two flowering spikes at the same time. The finest, fieriest, most fervent of the lot - if you're looking for flowers to match your passion, these are the ones. These 100 red roses bouquet in full bloom are the ultimate symbol of love, so go ahead and express your love big time and in big size. Pink roses are associated with grace, sweetness and are fabulously versatile when you have something important to say. While white roses associated with Innocence, charm and reverence. When presented, the combination of these two colors make a strong statement. Useful in borders, flowerbeds, rock gardens and containers, the vinca flower provides instant color wherever it grows. The round, flat blooms appear on top of 12- to 15-inch stems. These drought-tolerant bedding plants thrive in any soil type as long as it is fast draining and not overly fertile. Select this perfect loving gift for send to your best one of your life and Deliver your lots of love with this fabulous 8 PCS teddy of ( 6 inches) in a tempting bouquet in Colored Paper Packaging Suitable Ribbon Booking from anywhere online.